Marching along with these 2008 monthly reviews, next is March. Marching along... See what I did there? Yeah it was stupid. Highlights of March 2008 include flashbacks to meeting Princess Di (back of her head), Photography, drinking, evilness, smurfs, slang and much more.. Lets go back, way way back, no not that far. This is a post about wee me, as in me as a child, I was one once. It has chimpanzee's and a real meeting with the person formerly known as Princess Diana. I know the mere mention of Princess Diana, will have some folks flocking that post and other running away. Its worth a look just to see tiny me. Some really cool photographs of a mill building, which was actually a mine building. I was intrigued so I did a little bit more research on them. The Mine and More on the Mine. I love books and I love reading, but when in the library I just get sleepy and giggly. This is not good when you are trying to study. I have struggled with the word nice for a long time, I mean who wants to be nice? The real question is what is wrong with being nice? An evil blogger by the name of Ender smurfed me, which means she used a photo of me and turned me into a smurf. It's horrific and I bloody hate the smurfs. Always wanted to glimpse into my bedroom? Well now you can see some freakishly haily hailstones from my bedroom window, exciting! (or not). My Hairy Beaver, need any more info than that? Twas the first post I made about my USA trip that coming September, I was so excited I interviewed myself. 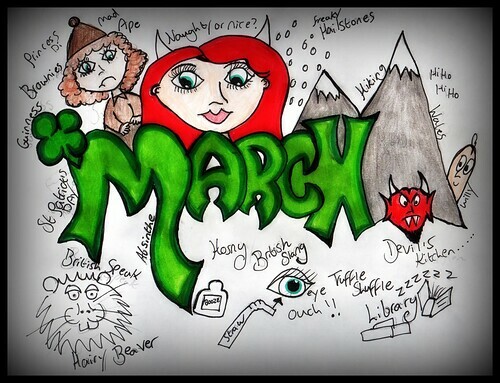 I shall always love this day in March, as it reminds me of my Granddad Pat who was Irish, really Irish as in from Dublin. I also happen to love Guinness, so happy days. In the January review post I revealed that I was an uber dork, the Truffle Shuffle incident is more proof to that affect. This then led to a discussion about what a 'Truffle Shuffle' was, I hope you know? Or at least remebered from the first time I posted it. Truffle shuffle and the Straw and What is the Truffle Shuffle? Like the name implies this was a devilish place to hike, the weather was a bit iffy but it was still beautiful. The video and accompanying music really add to the spooky factor in this post. Also Willy got a bit excited by the sight of snow, as its the only snow he has ever seen. Doodling the Devil, Hiking in the Devil's Kitchen and Willy gets high in Wales. These two shots definitely show off the rugged beauty that is North Wales, I hope you like them as much as I do. I so want a better camera, maybe next year! Wordless in Wales and Can't be arsed writing. Eh up me china plates, I love British Slang. Partly because I am British and partly because I love confusing the pants off people. So this post was a lead to a guest post I did on Bristish Speak. Go on you slags and wankers have a butchers at it. Ever wanted to see blog central? As in the place I blog from the majority of the time. It may look tidy in that post, but at the moment its a holy show! Time stands still for no man, woman or blogger. Oooo, you went hiking in the Devils Kitchen! I went there last April, it was gorgeous, all the wildflowers were out and the weather was scorching! Can't wait to go again. It hailed when you were there? Not much fun for getting down but I bet it looked amazing. We got down via the Glydders. Fab. Ahem. Sorry to go on, but you jogged my memory and it was lovely. I disagree!!! Your messy blog-station is CLEAN!...cleaner than my clean blog-station! When you make your way back to America (hopefully soon! ), you can interview yourself yet again! See? Now you have inspiration to come back over! I think I discovered your blog in March, or maybe April - it was around the british slang time. I dont' feel bad that you didn't mention meeting me in your post review tho. Okay -- off to pierce the wahoo. Okay - just noticed your last tweet was to me again! LOL So apparetnly, I'm the last person you tweet every day.